The play opens when Henrietta (an appealing Audrey Johnson) is offered a job at Harvard working for Edward Charles Pickering as one of the human computers, all of whom were women (see also the new movie Hidden Figures, another example of the "harem effect" in science). She leaves her beloved sister (Kayla Hambeck) to do this work that became her life, sometimes to the detriment of her relationship with the family she left behind. Along with her fellow computers (Danielle Krivinchuk and Beth King, injecting some humor into the story) she documented and classified the stars. But she wanted more, and the discovery of a pattern lead her to her great discovery that the distance to each star can be calculated (how do you measure a year? measure in light). The play also includes an obligatory but sweet romance with her colleague (a charmingly awkward Gabriel Gomez), but in the end, her work is what fulfilled her, and what she's remembered for. poignancy. The sparseness of the set (designed by Brian Proball and Emma Davis) serve the story well. Lyric Arts often has really detailed and massive sets, but I'm glad they went in the opposite direction in this one. The completely bare stage, with just a few desks as set pieces, allows for a feeling of space, openness, and vastness that matches the subject matter. Projections over the stage and on each side are used subtly and effectively, with a few twinkling point lights hinting at stars (lighting and projection design by Jim Eischen). The play provides a picture of who Henrietta was, even if the timelines are a bit collapsed and unclear. There are a few references to "years" passing, but nothing to really anchor us in history. Based on my impression of the play I thought died in her 20s or 30s, but in reality she was 53, still way too young of course (one could say she studied stars "like she was running out of time,*" because she was). But no matter, it's not a documentary. 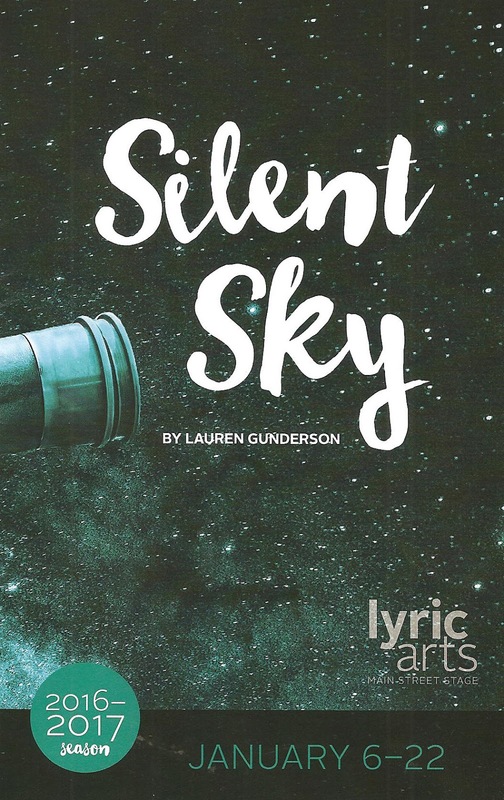 What Silent Sky does is convey Henrietta's wonder at the world and her fierce determination to answer the question of where we are in the universe. Upon the scaffolding of their discoveries, others built the structures that would enable us to understand more clearly where we are in the universe. To understand where we are, is to understand who we are. That is the grand question. To seek its answer is the greatest pursuit, not only of science, but of our shared humanity. Maybe it's because I'm a science nerd and a female mathematician myself, but Silent Sky brought tears to my eyes and cast a bit of a spell over me. I left the theater and immediately looked up at the stars twinkling so very far away in the crisp cold silent sky. Thanks Henrietta. 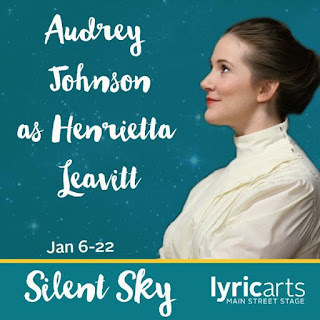 And thanks Lyric Arts for bringing us herstory (continuing through January 22). *Please indulge me the Hamilton quotes. I'm going to see it in Chicago this month so it's never too far from my consciousness.